Known as the absent king, Richard Plantagenet was known as a brave warrior. He even earned himself the nickname, Lionheart, a name that has reached epic and mythological proportions. This Richard the Lionheart Steel Shield honors him. 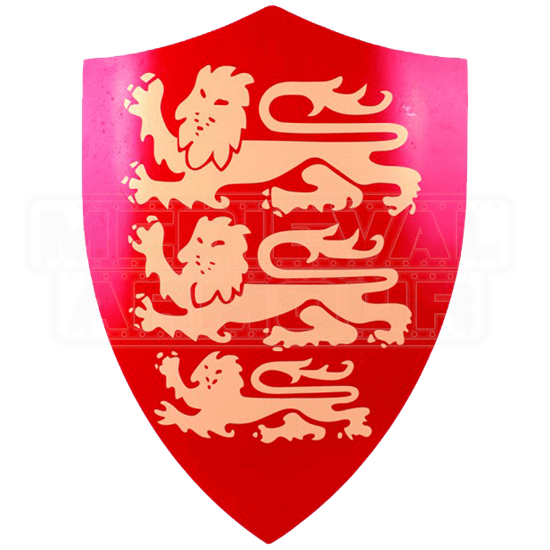 On the red face of the shield sits the coat of arms for Richard the Lionheart. Three lions represent the ruler of the Kingdom of England, Duchy of Normandy, and the Duchy of Aquitaine. This shield is made from 440 stainless steel and is suitable for hanging on the wall or decorating with. If you really want to show off your admiration for such a brave king, wear this shield by your side at the next medieval event that you attend.